Louis Fisson founded his car company in Paris in 1896. While only in business for a few years, he managed to build an unknown number of cars before he gave up the venture in 1898. There were two types available – a rear-engined and a front-engined model. This is of the front-engined variety and it is the only one like it that survives. It uses a 3.0-liter straight-two (the cylinders are giant) making eight horsepower. It spent a long time in a Long Island (New York) automobile museum and was sent back to Europe (the U.K.) in the 1980s. It was not restored until 1995 and it competed in the 1996 London-to-Brighton run. 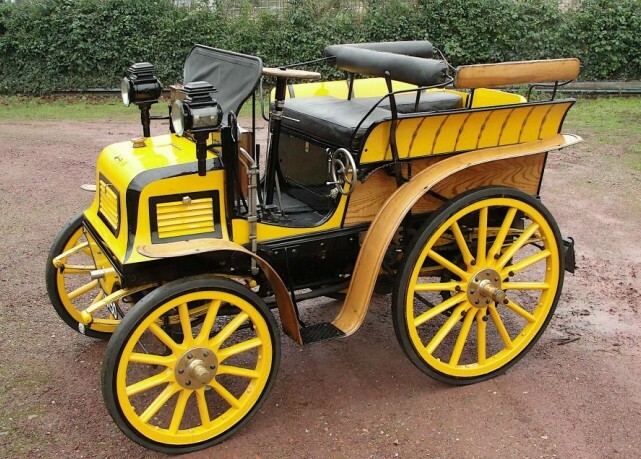 It is a very early, very rare motorcar that can be yours for an estimated $290,000-$340,000. Click here for more info and here for more from Artcurial at Rètromobile. This entry was posted in Uncategorized and tagged 3-litre, 8hp, artcurial, auctions, cars, classic cars, fisson, tonneau by classiccarweekly. Bookmark the permalink. Reblogged this on Dallin Henry's blog.